Not just fillings, these are services that we can provide for teeth in order to bring them back to original function and appearance. 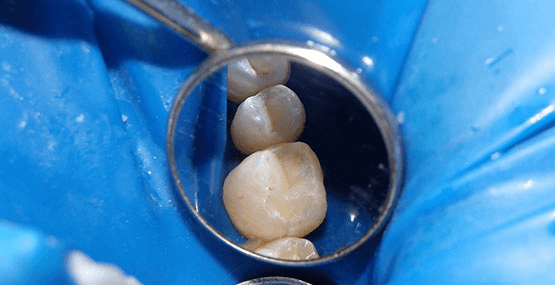 Whether a tooth has been compromised by decay, an old filling that is breaking down, or perhaps just has an abnormal shape or colour, we have plenty of restoration options that may be suitable. 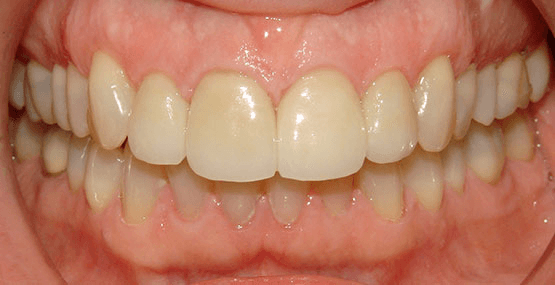 This case shows decay between the teeth, which usually only shows up on X-rays. 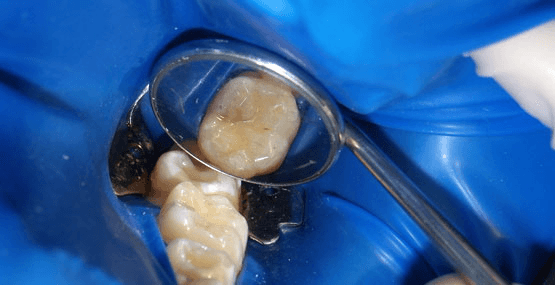 The first photo is an intraoperative photo with one of the cavities cleaned out and some of the decay on the other tooth left in, to demonstrate how things looked when we opened up the tooth. 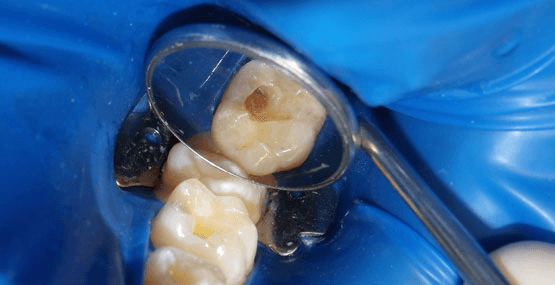 After the decay was completely removed, we placed direct composite resin (white) fillings in both to restore the original anatomy. (H3PO4(aq) etch, Kerr Optibond FL primer and adhesive, 3M Filtek Flow Supreme A2, Dentsply Esthet-X A2 for body). Tooth with visible open decay on the biting surface. Direct composite resin (white) filling placed after decay removal, bonded to the tooth. 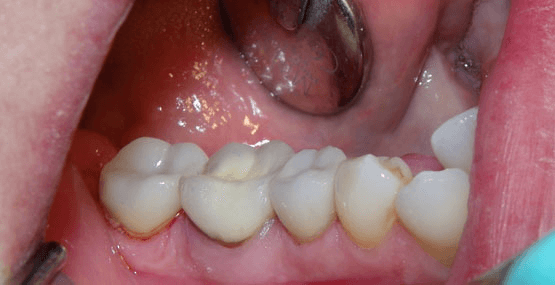 Crowns or onlays are required when so much original tooth is missing that a filling can’t be done properly. 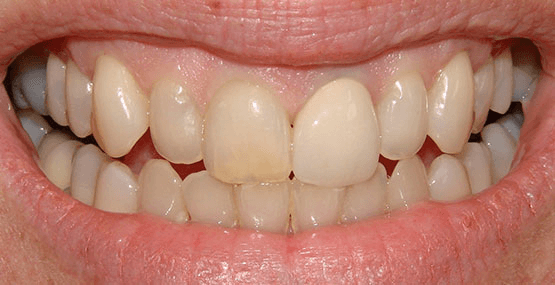 This is one of the more common scenarios where crowns are done – back teeth with wide / large fillings. 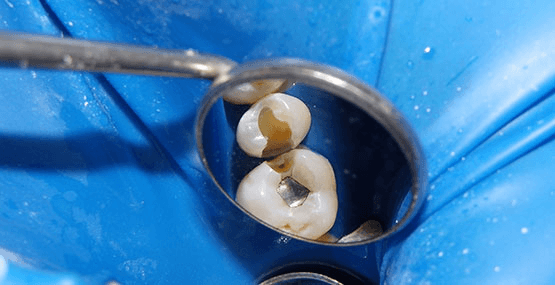 Although fillings are great materials, they only last if they are not excessively large. 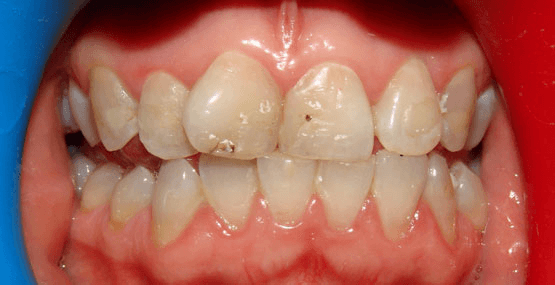 The wider the filling, the greater the risk of tooth fracture. 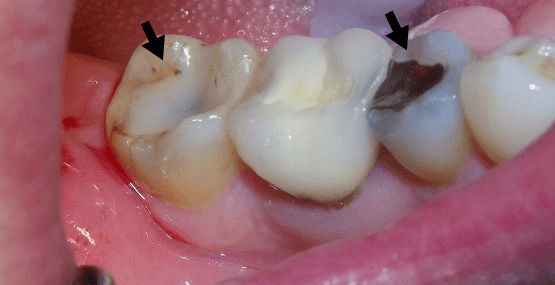 In this case, the last and third-last teeth (black arrows) both had very wide fillings (beyond half of the intercuspal width of the teeth), so the patient accepted our recommendation for crowns. Both were done together in a a two-appointment process: the first appointment to prepare the teeth, and the second to bond them into place. Clearly this was not done for aesthetics (back teeth that are not really visible), but the outcome looks great nevertheless! (Crowns on 47 and 45, digital impression using 3Shape Trios, Emax crowns adhesively bonded due to short clinical crowns using air abrasion (PrepStart), acid etch (Bisco Uni-etch 32% H3PO4 with BAC), Calibra adhesive resin cement following recommended protocol. Lab work courtesy of Image Dental Laboratory, Barrie. Veneers can be placed to correct a number of problems, from colour discrepancies, chipping, malformed teeth, to minor alignment problems. 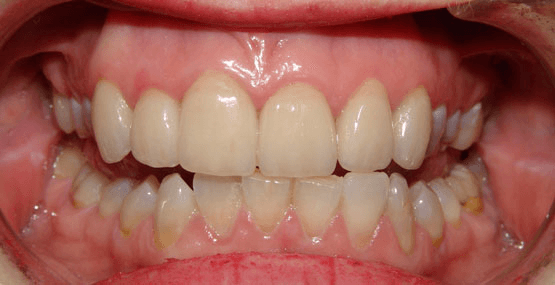 Be careful here, veneers are not a panacea as they may be portrayed elsewhere. Like anything else, there is a proper time and place for veneers, and they should not be placed indiscriminately.